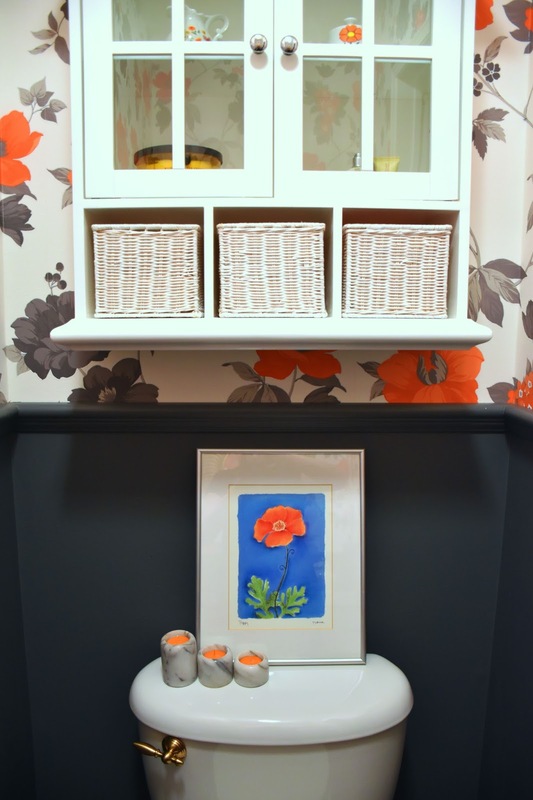 Woman in Real Life:The Art of the Everyday: Our Powder Room Makeover - The Big Reveal! 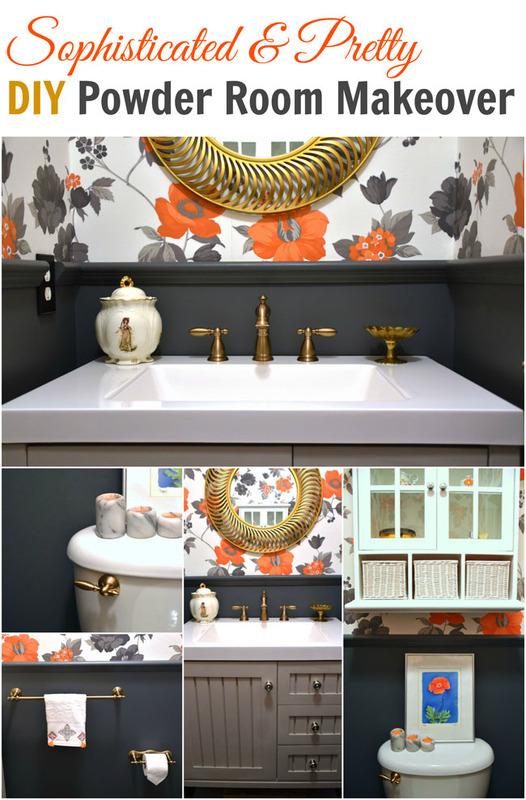 Our Powder Room Makeover - The Big Reveal! 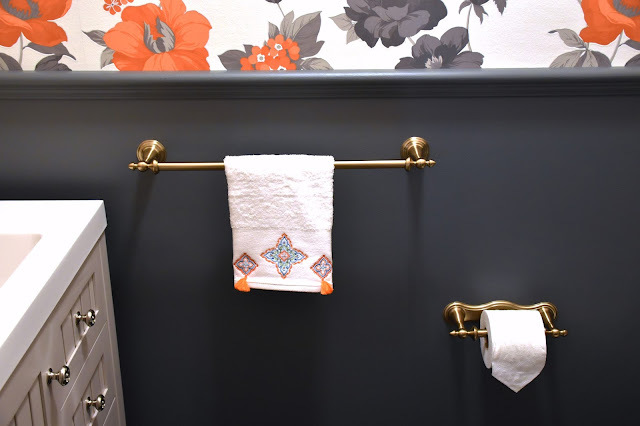 Our powder room makeover is complete! I'm pretty sure our tiny bathroom space couldn't look any more different from the bland, purely functional original space it was. Before, the powder room didn't have much to say about the family who lives here or the things that bring us joy. (I know, enough with the Marie Kondo already!) Now, when I open the door to the powder room, it sings to me. It reminds me of spring, good cheer and, quite frankly, my younger days. You see, we got a bit "safe" in this home. The tiny Toronto apartment we lived in before kids had three rooms and three different vivid colours - deep green in the kitchen, sunny yellow in the living room and dark blue in the bedroom. And we loved it. Although we won't be getting that "colour brave" again, I think we are finding our way back to colour, this time with a more sophisticated approach befitting our ages and tastes. 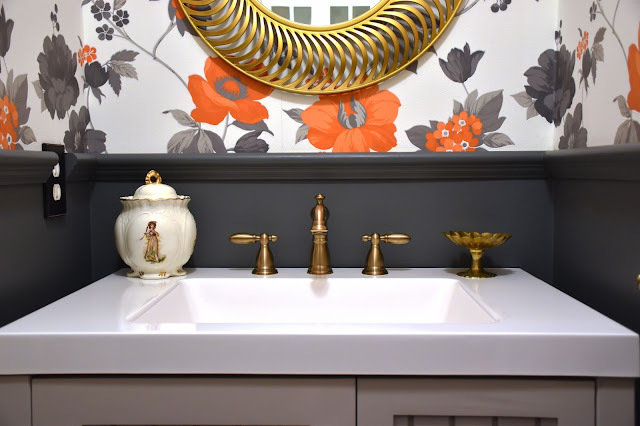 Clearly our most bold choice for the powder room is the Eden Orange/Grey/Cream wallpaper by Graham & Brown at The Home Depot Canada. Prior to our recent foyer makeover, we didn't have any wallpaper in the house and we had never installed wallpaper in our lives. It took some convincing to get my husband to agree to use wallpaper for the foyer. "It will just be a feature wall," I said. "And only above the chair rail." It didn't help that our brother-in-law had recently thrown out the wallpaper he bought for his bathroom makeover. (It ripped when he tried to put it up.) But we found a durable, paste-the-wall paper and the process wasn't bad at all. So, of course, I broached the subject of wallpaper again for the powder room. I'm not going to say my husband was excited about it (we were both a little nervous about wrapping wallpaper around a whole room) but he pretty much just knows how stubborn I can be when I want something. So here we are. We googled our way through handling wallpaper on corners (don't just wrap it around the corners and keep going!) and it went pretty smoothly. Be sure to have a small tube of wallpaper adhesive on hand in case any edges are not secure. Having selected such a bold wallpaper, I chose to apply it only in the upper portion of the room. I was warned that such a bold pattern would make the room seem smaller, but really I'm not hoping to fool anybody into thinking this room is spacious. 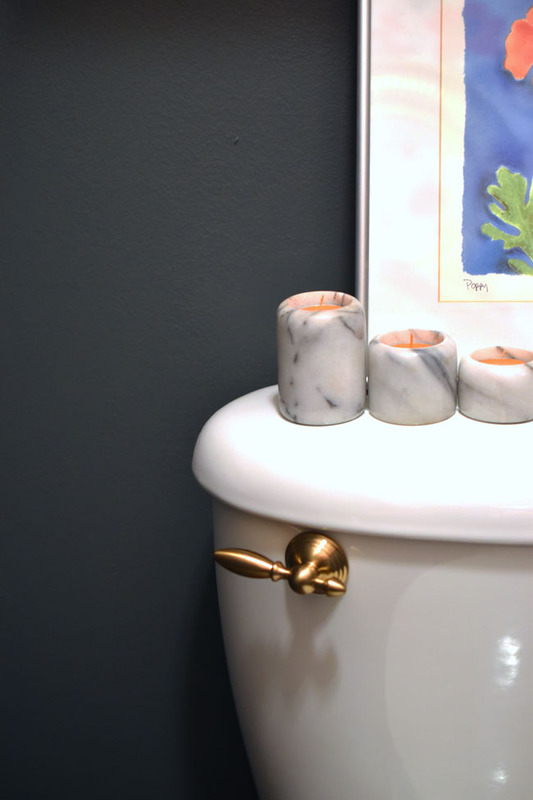 Better to have something pretty to look at when you're doing your business I think. Fortunately we had some beautiful Metrie French Curves chair rail left over from our foyer makeover. We used that to divided the upper and lower portions of the wall. In terms of the height of the chair rail, I don't know if there are any rules for bathrooms. I took a look at several bathrooms online and on Instagram to see what height of chair rail appealed to me. What I found was that I like the faucet to have space to shine. I preferred when the painted space cleared the faucet. So we set the chair rail just above the faucet. For the bottom of the wall, we chose Behr Marquee interior paint with primer in an eggshell finish. The colour is dark ash. 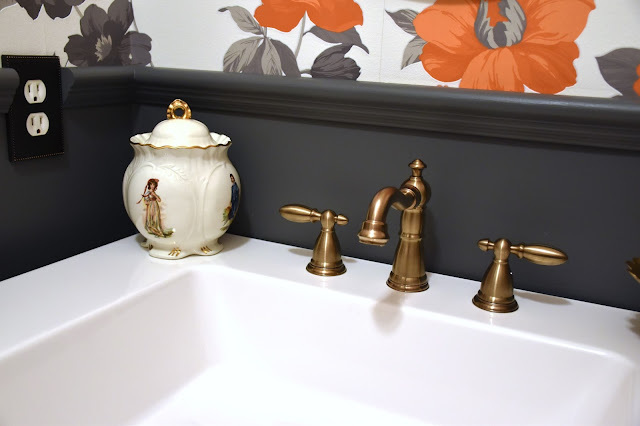 We initially debated painting the bottom portion of the wall white or light grey, but when we held up the Behr paint chips against the wallpaper, dark ash spoke to us. We felt it was a bit riskier than some of the medium greys, but it coordinates nicely with the darker areas in the wallpaper and also grounds the space. The vanity we selected is the Martha Stewart Seal Harbor Vanity in Sharkey Grey Finish. Clearly it's much bigger than the pedestal sink we had previously. But the space around the pedestal sink wasn't doing anything for us. 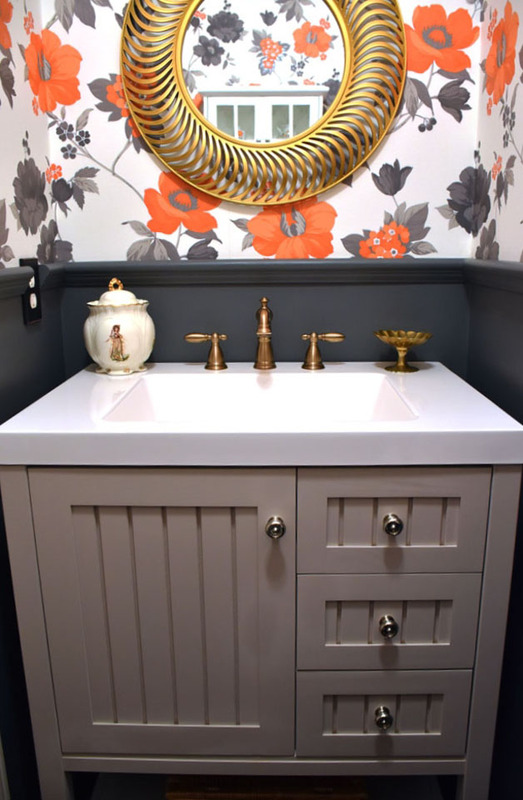 This elegant vanity gives us ample storage in a tight space and looks darn pretty while doing it! There's even a sliding drawer inside the cabinet, perfect for storing cleaning products. The top drawer of the three drawers on the right is great for storing extra toothpaste and toothbrushes for the kids. And toilet paper fits perfectly into the other drawers. There's also a shelf at the bottom, great for housing wicker baskets full of towels. My husband had to make some minor changes to the plumbing and also cut a hole through the shelf inside the vanity to accommodate the plumbing. But he's never done it before and he was able to manage it fine with a bit of online research and chatting with a co-worker. The investment was very minimal (especially when you consider the cost of a plumber). 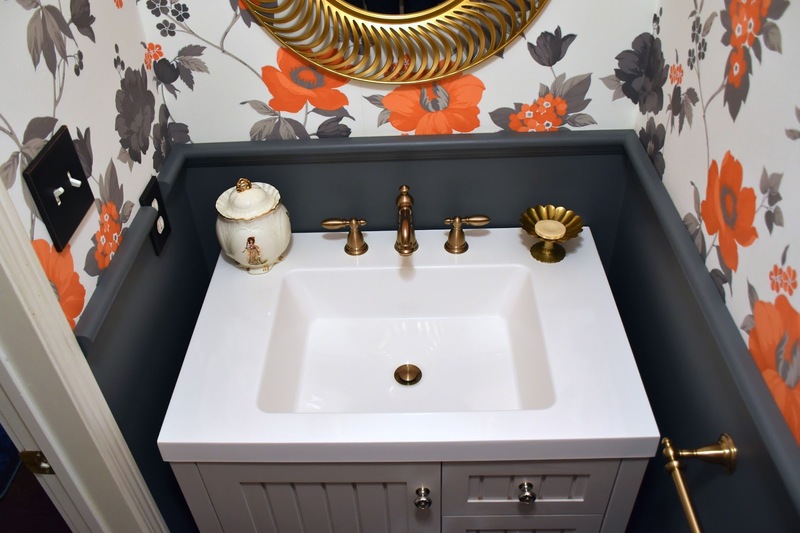 This Martha Stewart vanity has a cultured marble top with an integrated sink. 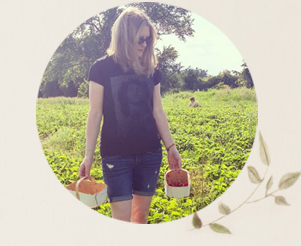 It is lovely to use, easy to clean and has wider sides, so I can accessorize with some of my vintage goodies. And it comes pre-cut with three holes for a widespread faucet. I love the look of faucets with separate handles. 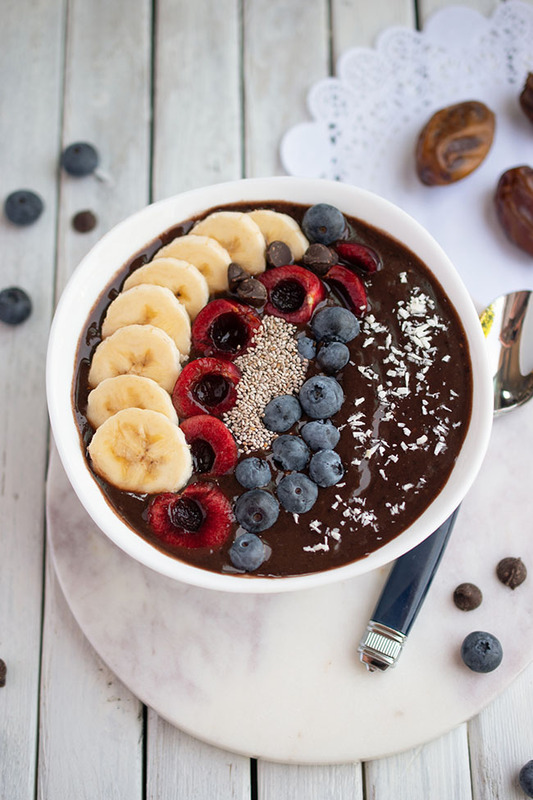 So clean (and easy to clean!). And speaking of the faucet! Isn't it a thing of beauty? 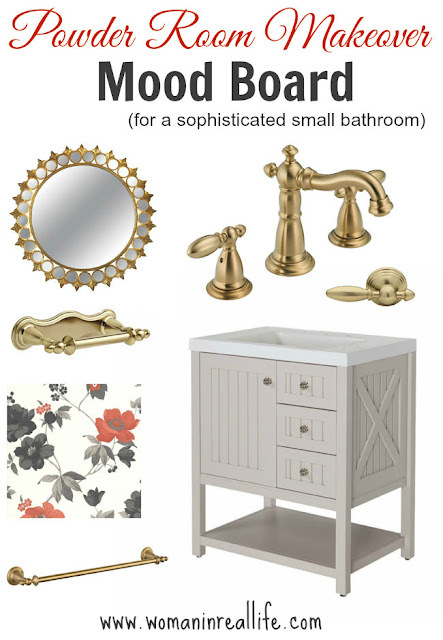 As I pointed out in my mood board, we chose Delta's Victorian™ Two Handle Widespread Lavatory Faucet in a champagne bronze finish. I literally go in the bathroom just to stare at it. Not even kidding. We had a 24" towel bar before and it was just too big for the space. This Victorian 18" Towel Bar is plenty big and has a beautiful champagne bronze finish like the faucet. As does the Victorian™ Toilet Tissue Holder. It has a pivoting arm so it's easy to change the toilet paper roll. Not that anyone else in the house will do it. And yes, I folded my toilet paper into a triangle for the photos. I couldn't help myself. Won't happen again. We decided not to switch out the toilet, since it functions perfectly well. But we did switch out the plain white handle for this Delta Victorian™ Universal Mount Tank Lever. We discovered that this change is not simply an aesthetic one. This lever actually works better. It's fastened firmly and it's durable. In fact, the whole bathroom functions better now. The water flows so beautifully from the faucet and runs down the sink more efficiently. It feels like a more luxurious space. We hung our white storage cabinet back up (sorry to my mom and sister who both asked if we were getting rid of it!) and I went around the house in search of a few orange accessories. We decided to replace the wall plates covering the electrical outlets and light switches too. That's what makes decorating a whole room from start to finish so fun. And addictive. Once you start, you just can't stop. In this case, I stuck to the mood board almost completely, except for the mirror. I found an inexpensive version (on clearance for $14.99 actually). And I added paint and a few accessories to the mix. I wanted to have the wallpaper in hand before selecting the paint. Aside from new towels, I used accessories I already had around the house. So, what do you think? Are you a fan of wallpaper? Do you like colour in your home or is it all about white? What do you think of our refreshed powder room? Thank you to these wonderful sponsors who provided materials for our powder room makeover. All opinions are authentic and my own. I really like that wallpaper, it's so cheerful & coordinates so well with the paint colour. The. Whole room is impressive. Congratulations to you and Lou. well done! 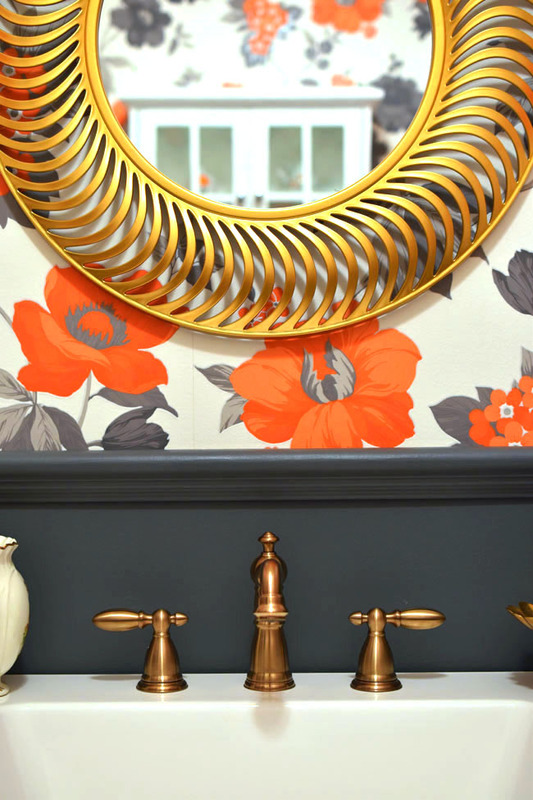 I like wallpaper and I especially like orange :) Those faucet handles and the toilet flush handle are beautiful. I did pick up on the folded triangle toilet paper, ha! I didn't know how much I like orange until I found this wallpaper! And I agree, the Victorian champagne bronze items are beautiful! You have a sharp eye, spotting that paper. Haha. Thank you! Joann, it's gorgeous! LOVE the color choices! What a fantastic job you guys did! I love it! Great job!! The powder room looks beautiful, love the colours. It looks beautiful, so much nicer than the 'before'! What a beautiful job! 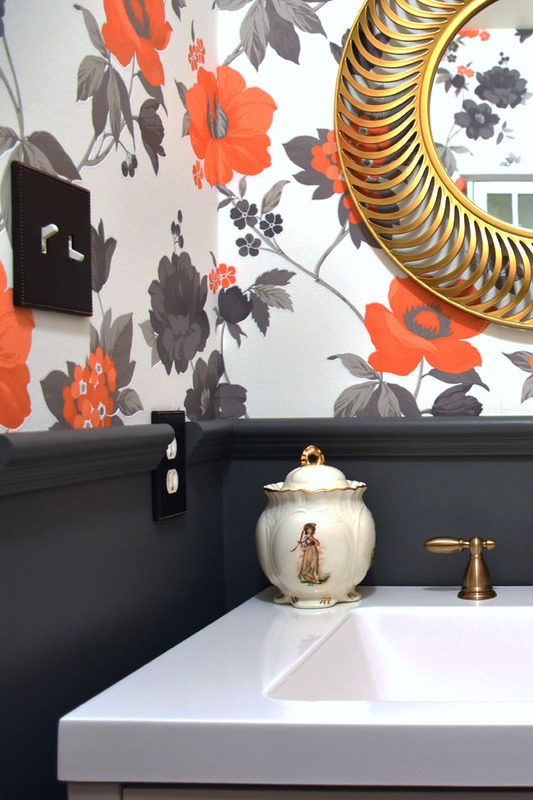 The wallpaper is stunning -- so cheery and welcoming. I absolutely love that vanity!! Wow! I am totally in love with that wall paper. I can't believe what an amazing job you did with such a tiny space. Your wallpaper is fantastic and so are the colours you chose. 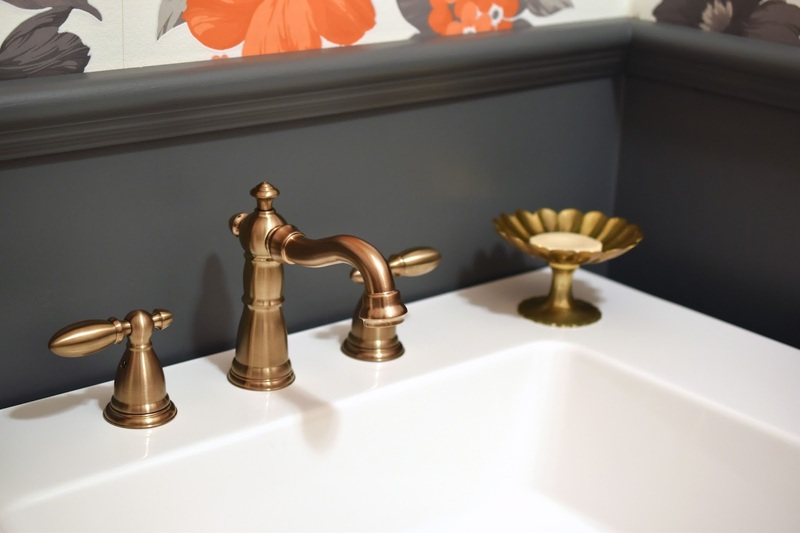 Great fixtures and faucet too. Way to go. 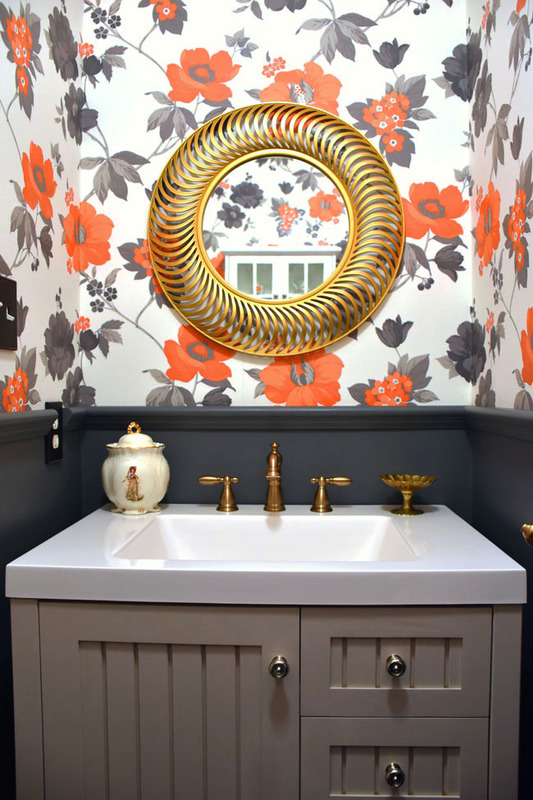 Love the vanity and pretty much all of it. Nice job!